Kids are natural scientists. It’s their job to notice, to explore, to experiment. When I was twelve I went to Camp St. Croix, a YMCA camp on the St. Croix River, the serene, still-relatively-wild waterway forming part of the border between Minnesota and Wisconsin. My cabin group’s adventure that summer was canoeing the St. Croix to its confluence with the mighty Mississippi at Hastings, Minnesota, and then 350 miles down the great river to East Dubuque, Illinois. We learned a lot about water on that trip: respecting its power, managing large waves, using its properties to skillfully maneuver a canoe, and trying to keep it out of our packs and tents. Of all these lessons, one observation really struck me—though its explanation continues to elude me to this day. 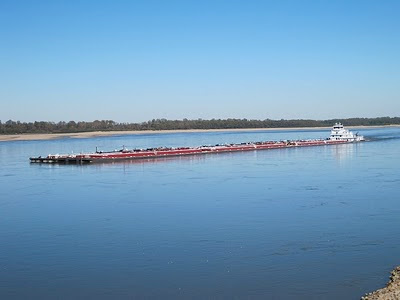 One night we were camped on one of several narrow channels the Mississippi assumes along that stretch. After supper, our campfire gradually died out and it got so dark that there was nothing to do but go to bed. As we felt our way toward our tents I noticed an eerie glow on the trees on the other side of the channel, and stayed outside to investigate. 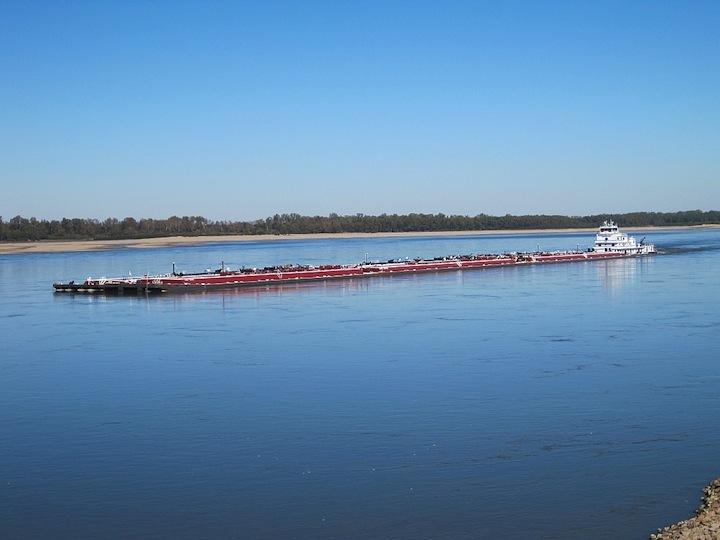 How far...would the huge vessel’s displacement raise the level of one of the world’s great rivers? I don’t know what made me think of it, but I was curious what a fully loaded eight- or ten-unit river barge and pusher would do to the water level. So, well before it reached our campsite, I pushed a foot-long stick into the sand at the water line. How far, I wondered, would the huge vessel’s displacement raise the level of one of the world’s great rivers? By the time the barge finally lumbered past our campsite, my buddies had heard it and come outside. They joined me in exuberant hoots and howls and, sure enough, the pilot noticed and turned the spotlight on us. I could’ve sworn I felt the heat from that blinding ray! 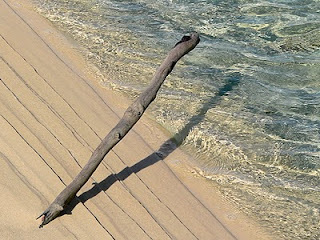 Despite the excitement, I remembered to keep an eye on my stick and noticed that, instead of climbing the shore as I’d assumed it would, the waterline had dropped—and not by an inch or two, but by more than two feet down the sandy slope. I figured this indicated a vertical drop of several inches! How could that be? I imagined taking any container of water and pushing any object into it. How could it possibly do anything but raise the water level? The waterline had dropped—and not by an inch or two, but by more than two feet down the sandy slope. Now, I could understand it if the water went down after first going up—the theory being that the barge pushes a hump of water in front of itself. But this isn’t what happened; the water line just moved down and then back up to its normal height. I still get to watch the Mississippi, now within a block of my home. I’ve repeated my experiment countless times and, despite what common sense might suggest, the water level still drops every time a loaded barge goes by. When I Google the phenomenon, I don’t find a single reference to it. If you ever find yourself on the banks of a major river with heavy commercial shipping, try the stick-in-the-sand experiment for yourself and let me know what you find. And you physicists and engineers out there: what’s the deal? Now I'm going to have to Google it! Where's Newton when you need him? Thanks pea - hope you find an answer and will share it here! Hey Mandie - Thanks for the idea. I guess that's as good an explanation as I've seen, but still, if the props are pulling enough water back to make the level go down, then you'd think all that water would have to go somewhere, making the level go up somewhere else. It never goes up. Hey NR -- I'm glad you find the post helpful. 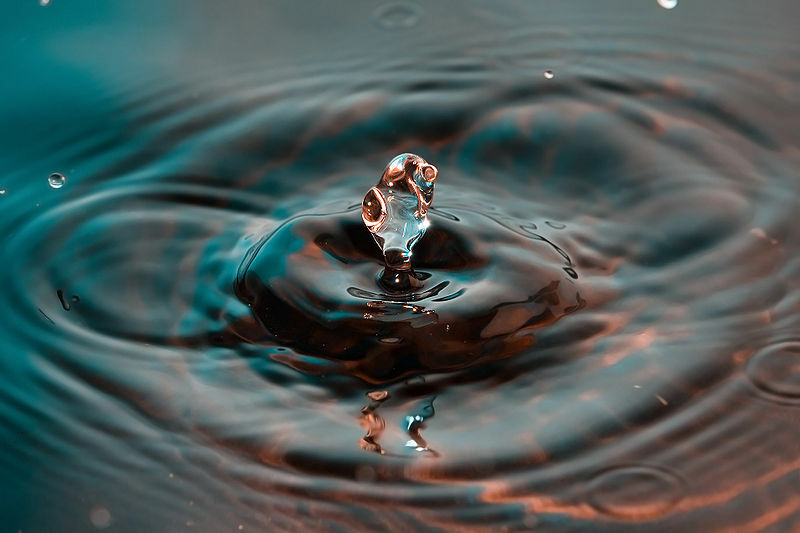 Sorry not to have an answer to why water acts this way... but then again life's so much more interesting when there are more questions than answers. Don't you think?